Every parent wants their child to have the best birthday and the biggest draw at every child’s party are the games. Throwing a birthday party is an exciting prospect, right from thinking of unique party themes, renting bouncy castles to employing magicians to entertain the crowd. Let’s face it – everyone loves parties. Believe it or not, the children do too. Each person has their own idea of a party but a common factor in all the ideas must include – fun. Parents often find themselves confounded about what to do for their child’s birthdays, especially when it comes to arranging birthday games. Birthday parties increase your child’s self-esteem, help them make new friends and create everlasting memories that they will keep with them forever. One of the participants plays grandma and stands in the room with their backs turned towards everyone. All the other children then line up towards the other side of the room. When Grandma’s back is turned, everyone is supposed to come closer to her. Grandma will turn around at any moment now, and if she catches anyone moving, they have to go back to the beginning. The first person who manages to reach grandma and tap her on the shoulder wins and gets to be the grandma for the next round. A traditional party game, in this all children except for one are supposed to stand in a circle, hold hands and lift them together in arches. The one child that is not a part of this chain moves in and out of those human arches to the sound of ‘In & Out the Dusty Bluebells’. When the rhyme’s chorus starts, the child will stop wherever he is and taps the person in front of him on their shoulders. Then, these two children will form a chain weave arches together. The chorus keeps repeating and the chain keeps getting more and more chaotic! All the children sit in a circle and one of them gets picked. The chosen one then has to walk around the circle and tap each child on their head while calling out ‘duck’. After a while, the child will say ‘goose’ and run around the circle to get back to the place where they were sitting. Now, the ‘goose’ has to try and catch them. If the first chosen child manages to finish a round of the circle before being caught, they sit down and the chaser gets his turn. If not, the same child gets to have a go again! This is a game that needs a garden or a big room, as space is required. A large area has to be cleared. Then, arrange that area with ‘islands’ – cushions, pillows, beanbags etc., on the floor which will form the obstacle course. Once the course has been set, all the children have to go around the room, over the course and try not to fall in the river, which are the obstacles. Whoever falls in the river the least is then adjudged the winner. This is another fun game that requires a lot of space. A pony jumping course needs to be set up. Pots, bamboo sticks, and planks can be used to create the course. Each child is then handed a number and they have to run through the course pretending to be ponies. Once they’re racing against each other, throw in some commentary and take the fun to the next level! All the children are supposed to be lined up on one side of the room. Then, one or two other children will be made to pretend monsters in the middle of a forest. The children then have to run across the forest without getting caught by the monster. If the monster manages to catch them, they become monsters as well. This fun and frolic will continue until one child gets caught. The last child who has not gotten caught at all is then the winner. Also called musical chairs, this is one of the oldest and most fun birthday games for everyone, children and adults included. Get the children to dance to some music, when the music ends they have to quickly find a chair and sit. The last one to sit or the one that’s left without a chair is out. The last child that is still left dancing is then the winner. One child closes their eyes, and all the other children are in a circle while holding hands. Without breaking the human chain, the children have to tie themselves into the most complex knots possible. Once they’re ready, the child with the closed eyes is supposed to come back and open the knot, while being careful as to not break any of the links. The funny bit is when children start falling in these attempts. Another game that needs a little bit of open space and some sand. Put some assorted treasure pieces like coins, chocolates etc. in a sand tray and evenly spread it out. The treasures need to be completely hidden in the sand. Each child will be handed a flag with their names on it. The children are then supposed to plant their flags wherever they think the treasure is hidden. Once everyone has taken their turns, they uncover the treasure and whichever child’s flag is planted closest to the treasure, wins! Get all the children to sit on a table, or a floor if there are a lot of participants. Hand everyone a towel, on which we can place around 10-15 raisins or peanuts, a small box and a pair chopsticks. The child that manages to transfer all the things into the box using only chopsticks wins! 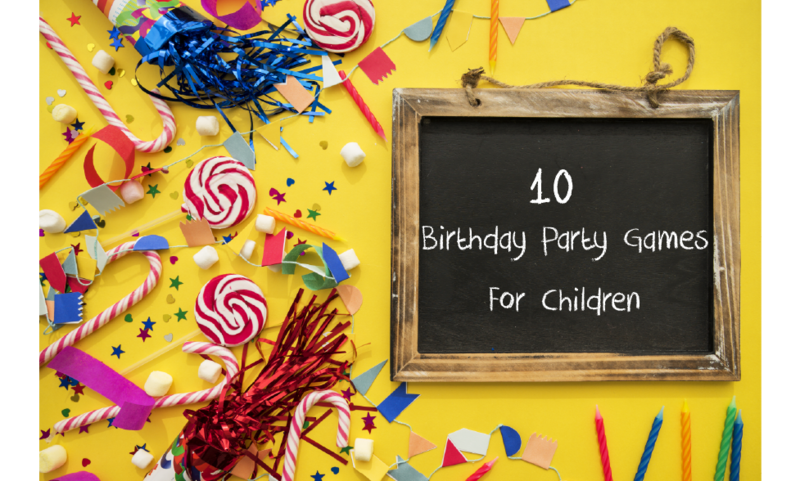 Children’ birthday parties can be a lot of fun with these games thrown in. These games are not only fun, but they also offer children the chance to participate in games and activities that they usually won’t – and most importantly, win! Birthdays are the most exciting day of the year for children, more important than any other day. Children count down the months, days and weeks until their big day comes. With great anticipation, they keep asking their parents, “Is my birthday today”? We, as parents, on seeing this can’t afford to be unaffected by this excitement and that is why the onus is on us to make that day the best for them. Birthday parties are serious business for your children – make sure you always outdo their expectations!